April 9, 2018 By Goodall Staff - s.h. Is it time to spice up your backyard? If your answer is yes, then it’s time to get down to business! From spas and pools, to swim spas, and more, the options are truly endless. Before you start to feel overwhelmed by the many choices available, let us introduce you to a new world – where relaxation and fitness are combined into one compact system. Read on to learn about the top six reasons you need an outdoor swim spa in your life as soon as possible! Is a pool installation a little too expensive, or your backyard doesn’t have the capacity for it? Does a spa seem like an incredible idea, but you might need some more flexibility for fitness and recreation? Sounds like a swim spa is the solution for you. An outdoor swim spa provides the perfect combination of a pool and spa. Most swim spas, like the many models from Hydropool, will offer a dual-temperature system. This means that the swim spa is divided into two sections: one with comfortable seats and warmer water, similar to a spa, and the other with cooler water and more open space, just like a swimming pool. Even the systems that offer one large tank will still offer many of the amazing benefits that make spas and swimming pools so desirable. These systems will offer a few ergonomic seats, powerful hydrotherapy-inducing jets, and a user-friendly control system so you can adjust the temperature to your liking. If so, soaking in your outdoor swim spa will become your new favorite pastime. The warm water combined with the massage from the jets is enough to help ease muscle tension and soothe sore joints. Especially when paired with the natural buoyant effects of the water, which helps to lift up to 90% of the weight from your body. Your muscles and joints will finally have a chance to feel free from the weight of the world, which will truly allow the jets and heat to work their hydrotherapy magic and do some much-needed healing. These are only the beginning of the many health benefits that relaxing in hot, jet-driven water can offer. Grab your favorite bathing suit and prepare to work up a sweat! Actually, chances are you won’t even notice that you’re sweaty when you exercise in a swim spa. In fact, you probably won’t notice the feeling of fatigue that washes over you during most dry-land fitness routines. The water helps to lift pressure from your body, offering the feeling of weightlessness. This makes water-based exercise all the more appealing and effective, as you won’t tire out in the first few minutes. But don’t get us wrong – swim spa exercise can still help you lose weight and maintain a well-balanced healthy lifestyle. Not only does the water enable a low-impact workout, but it also adds resistance, so your body will have to work harder to complete each move. In fact, swim spas are designed for exercise. At the far end of the open-concept tank, most swim spas are fully-equipped with a powerful jetting system. This high-powered jet provides a stream of water that’s strong enough to offer your body a good amount of resistance, so you can walk, run, or swim against the stream. Forget having to sacrifice half of your available backyard space! Swim spas are essentially the compact version of your everyday swimming pool. Measuring anywhere from 12 to 18 feet on average, swim spas can easily fit into most backyards. If you aren’t sure if a swim spa will fit into your outdoor space, one of our outside sales managers would be happy to meet with you in your backyard to see what is available to you. 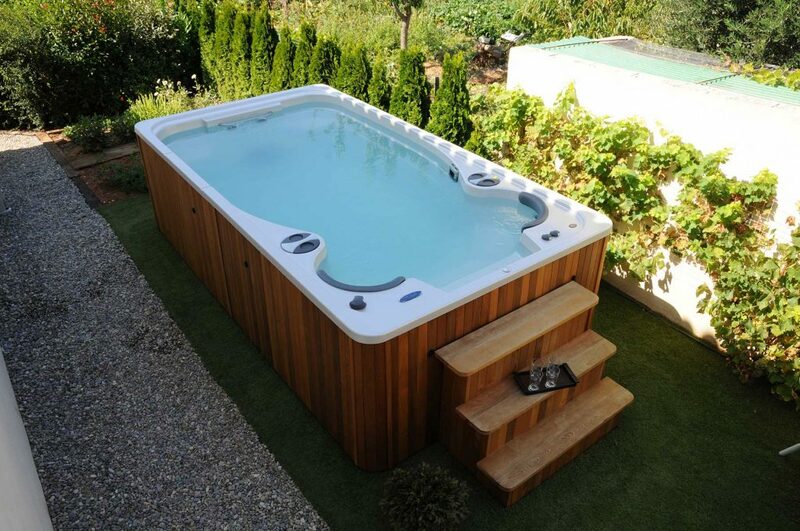 If anything, seeing our swim spas on display might give you a better idea of just how compact they can be! Especially when installed underground and/or included in a pre-existing deck or patio. What better place to relax, than in the comfort of your Pennsylvania backyard? Along with the installation of a swim spa, you can create the ultimate outdoor oasis. Include a variety of comfortable patio furniture, water features, exterior lighting, outdoor speakers, and even a fire pit to complete your backyard paradise. Simply immersing your body into the heat of the jet-driven water inside your swim spa is enough to relax your body, just wait until you get comfortable and let the sounds of nature truly transform you to a state of pure relaxation! Once your body starts to reap the benefits of stress relief and eased muscle tension on a regular basis, just watch how your sleep patterns improve! Simply soaking in your swim spa for 20 minutes about an hour or two before bed can make all the difference for the quality of sleep you’re having. The warm water and rocking sensation from the jets is the perfect remedy to help prepare your body for sleep. Once you lay down, freshly showered and relaxed after your swim spa session, you can seamlessly drift away to sleep. The combination of stress relief and eased muscle tension will make it much easier for you to get comfortable, fall asleep, and then stay asleep. Do you need inspiration for planning your outdoor escape? Look no further than our extensive collection of Hydropool swim spas for sale at Goodall Pools and Spas. We also offer a wide selection of affordable and high-quality backyard water products and accessories including pool cleaners, liner repair and more to take your outdoor experience to the next level. We’re located conveniently in Camp Hill, Harrisburg, Lancaster, Carlisle, and Lebanon, PA.